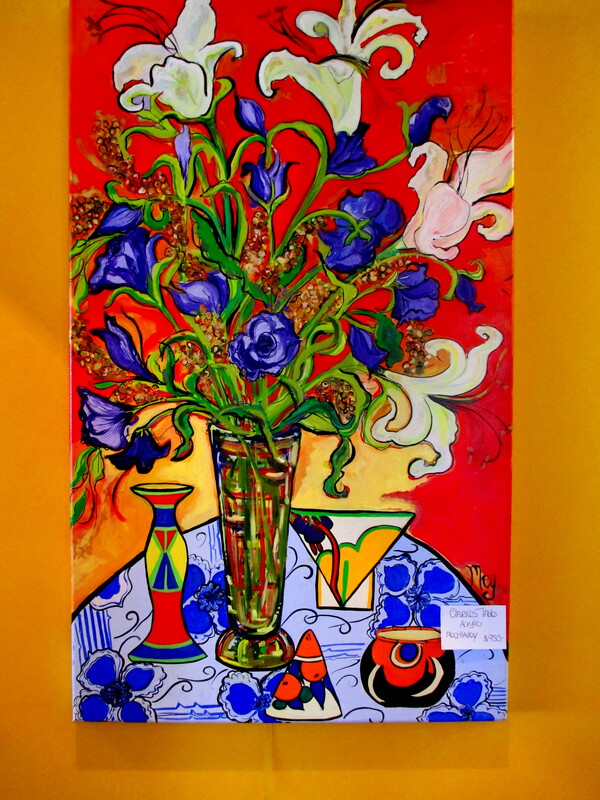 Clarice’s Table (gouache and acrylic) is a vibrant splash reminiscent of a Van Gogh floral still life. I saw this on exhibit many months ago at a winery which was show-casing local artist “Meg” aka Megan Hayley Abrecht. Meg is a Gippsland artist and decorative painter living in Warragul. She loves exploring colour portrayed through intricate intense settings with feathers, art deco china, repetitive patterns in fabrics and flowers. Her style and inspiration include both Mediterranean and Parisian influences. She quotes Van Gogh and Matisse as influential colour masters. She has moved from pastels, oils and now to gouache, finding it a quick drying medium with its vibrant colours which suits her work and gives her great pleasure. For more information on Megan Hayley Abrecht, click on her site. For further artworks – see my A-Z Artists page. This entry was posted in OilPainting, Paintings and tagged Gippsland artists, Matisse, Megan Hayley Albrecht, Van Gogh. Bookmark the permalink.